Bae "Bengi" Seong Ung is a Korean League of Legends player, currently the jungler for SK Telecom T1. He is the first professional player to pick Zac for the jungler role in a competitive setting. Bengi first appeared in the competitive scene playing a few games for team BBT in the NLB Winter 2012-2013, advancing from the Gold league, but losing to MVP Blue in the Platinum league. 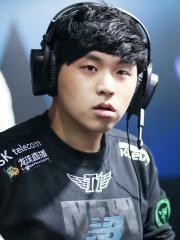 On February 28, 2013, kkOma added him to the initial SK Telecom T1 2 roster as the jungler. The team immediately qualified for the OLYMPUS Champions Spring 2013, and had a surprising performance by taking 3rd place, beating CJ Frost in a clean sweep but losing 3-1 to MVP Ozone. After the tournament, their sister team – SK Telecom T1 1 – disbanded and T1 2 was renamed simply to SK Telecom T1. Going into the HOT6iX Champions Summer 2013, they met everyones' expectations, reverse sweeping the KT Rolster Bullets 3-2 to win the tournament and be seeded directly into the grand finals of the Season 3 Korea Regional Finals. They met the KT Rolster Bullets once again and beat them in a convincing 3-1. They were the last Korean seed for the Season 3 World Championship but were the favorites to win the tournament. SK Telecom T1 crushed the competition, ending with a record of 15-3 and clean sweeping Royal Club 3-0 in the finals to become the new world champions. Before the start of the 2014 season, SK Telecom T1 picked up a new squad and named them "SK Telecom T1 S", with the original team being renamed to "SK Telecom T1 K". Bengi and his team continued to dominate the circuit by posting the best overall team performance in at the PANDORA.TV Champions Winter 2013-2014, not losing a single game, sweeping Samsung Ozone 3-0 in the grand finals. At the HOT6iX Champions Spring 2014, they lost 3-1 to Samsung Ozone in the quarterfinals. Bengi, along with the rest of the team, was in a slump, and after receiving an invite to the All-Star Paris 2014 event, it they were expected to be eliminated early. Instead, they swept the tournament with a 9-0 record and crushed OMG in the grand finals. They returned to Korea for the HOT6iX Champions Summer 2014, where they lost to Samsung White in the quarterfinals 3-1. They accumulated enough circuit points to play a tiebreaker for the 2nd seed to the 2014 LoL World Championship, but were crushed 3-0 by Samsung White and seeded into the 2014 Korea Regional Finals grand finals for their last chance to qualify. They lost lost 3-1 to NaJin White Shield and their chance to attend the World Championship. In the 2015 season, changes to the OGN rules forced the two SK Telecom T1 teams to merge back into one. Much of the original line-up from SK Telecom T1 K left the team except for Faker and Bengi. The new team was invited to the SBENU Champions Spring 2015. In the middle of the season, T0M was picked up as a sub for Bengi. They rotated throughout the season and eventually worked their way to the grand finals against GE Tigers. Bengi did not play in the grand final match but the team sweeped them 3-0. The win qualified SK Telecom T1 for the 2015 Mid-Season Invitational where they ultimately lost 3-2 to EDward Gaming in the grand finals. The team placed 1st in the regular season of SBENU Champions Summer 2015, dropping only one game to CJ Entus. They beat KT Rolster 3-0 in the grand finals to qualify for the 2015 LoL World Championship as the top seed from Korea. SK Telecom T1 went undefeated in the group stage, beating AHQ e-Sports Club and Origen in the playoffs without dropping a single game, meeting KOO Tigers in the grand finals and taking their first loss in the tournament, but ultimately winning 3-1 to give Bengi and the team their second World Championship trophy. Bengi is currently ranked #85 in highest overall earnings, and #5 in highest earnings for players from Korea, Republic of. The most money that Bengi has won from a single tournament was $338,000.00 from LoL 2016 World Championship on October 29, 2016. He placed 1st, making up 41.69% of his total prize money won. On October 4, 2013, Bengi arrived at the $100,000 milestone, winning $200,000.00 and placing 1st at LoL Season 3 World Championship. Prize money from 5 tournaments got him to that point.